The solar corona appears like a glowing halo around the moon. Tunc Tezel of The World at Night captured this image of a total solar eclipse on Nov. 14 from the northern tip of Queensland, Australia. Making a rare appearance over the northern tip of Queensland, Australia, a total solar eclipse appears with an angelic halo in this beautiful night sky photograph. Astrophotographer Tunc Tezel of The World at Night took this photo on Nov. 14. 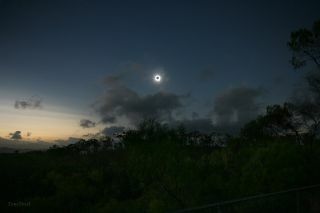 This was the first total solar eclipse in a decade in Australia. Humans will not see an eclipse such as this again until 2015. A total solar eclipse occurs when the moon line up between the Earth and sun, completely blocking out the solar orb in our sky. In the image, the solar corona or the extended outer atmosphere of the sun looks like a glowing halo around the moon.